Begins May 25 - Bookmark it! 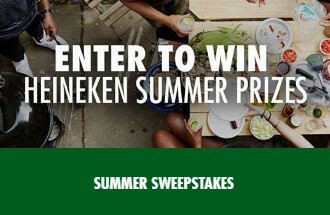 Heineken USA wants everyone to make the most of their summer by giving them a chance to enter daily to win Heineken summer prizes like Weber grills! Grand Prizes: A total of eighteen (18) grand prizes will be given away. Each grand prize package consists of one (1) Weber Genesis E-310 Black Gas Grill LP, one (1) set of speakers and one (1) $300 gift card. Approximate retail value (ARV) of each grand prize: $1,250. First Prizes: A total of thirty-six (36) first prizes will be given away. Each first prize will be a Weber Q 1400 Electric Grill. ARV of each first prize: $299. Second Prizes: A total of one hundred twenty-six (126) second prizes will be given away. Each second prize will be a grilling kit that consists of a Weber Original Burger Press and a Weber Original stainless steel three-piece tool set. ARV of each second prize: $50. HINT: You can actually get up to TWO entries a day. See the rules for details. This Sweepstakes ends on 09/26/16 and you can ENTER DAILY to win.